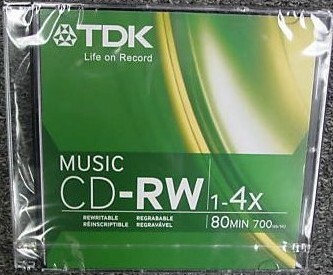 TDK Music CD-RW discs are rewritable media designed specifically for use in consumer audio CD-R/CD-RW recording decks. Music CD-RW discs allow users to overwrite audio data directly and repeatedly. TDK Music CD-RW discs record digital audio data in the standard compact disc 16-bit, 44.1 kHz format, for ultimate recording quality. TDK Music CD-RW discs utilize an exceptionally stable phase-change recording material to allow numerous rewrites and long archival life. Phase-change recording uses a laser to change the reflectivity of discrete areas on a disc surface. The recorded marks differ in their reflectivity from the unrecorded areas. These differences in reflectivity are read by a laser pickup as digital data. TDK Music CD-RW discs are engineered to the most exacting tolerances, for optimum reliability and durability. TDK Music CD-RW discs offer 74 or 80 minutes of digital audio recording time.